Next on our cookie agenda are these lovely lemon ice box cookies. 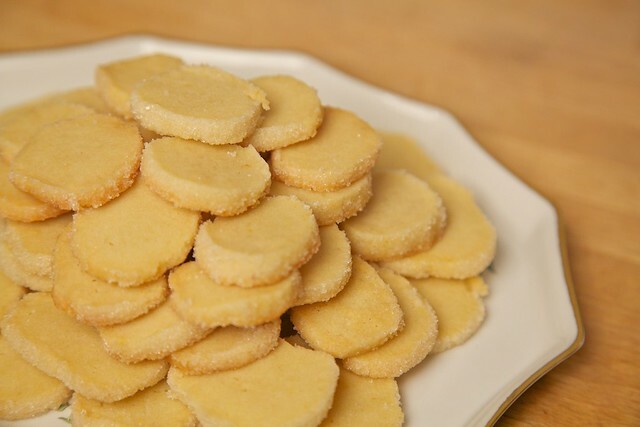 These tiny little cookies are the perfect bite-sized snack or after dinner treat. They would be great gathered in a pretty bag and given as a gift. They’re sweet and crunchy with just the right amount of lemon. You start with the lemon zest. 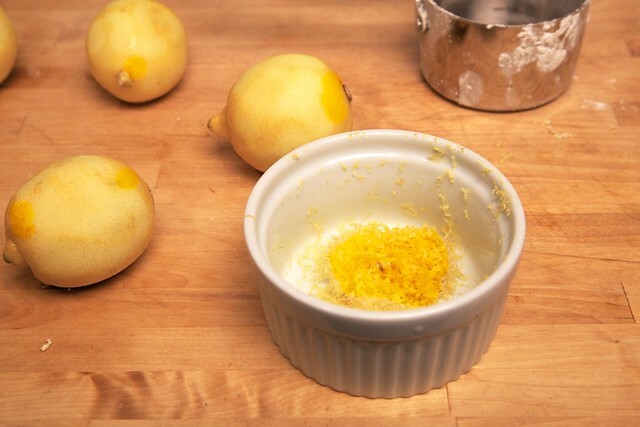 There is something that always excites me about putting lemon zest in a recipe. Perhaps it’s because I know it’s going to be delicious. I can’t wait till we have a home where I can have a lemon tree. I hate buying lemons, as I never seem to use them quickly enough, so I often don’t buy them and then I don’t have them when I need them…but I digress. 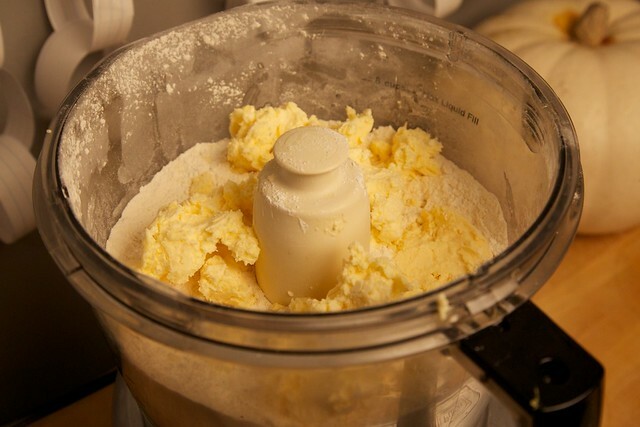 For this recipe we’re going to use a food processor. Make sure you have a big enough bowl (a mini food processor won’t do) or you’re better off just working by hand with a dough mixer. It is rather pleasing to watch your flour and Earth Balance mixture turn to dough, just like that, but don’t get carried away and over mix. Remember to pulse! This makes a fairly large batch, probably double what I was expecting, but the tiny cookies will most likely “magically” disappear once made. Plus you can keep the dough frozen for a few weeks and bake a few whenever you like. Now I have a little confession with this recipe. As I mentioned before, one of the most difficult parts of taking a standard cookie recipe and making it vegan is replacing the eggs. Eggs play many different rolls in baked goods and different substitutes serve different purposes. Since this recipe used only egg yolks, I wanted to add a little bit of moisture back into the cookies. The obvious answer here is water. So I plopped in 3 tablespoons of water, before I had mixed the dough, and right before I remembered that there were only egg yolks, not full eggs (think less volume). Immediately the dough was overly wet and impossible to handle. I had to add back about a 1/4 cup of flour to bring it to a better consistency. That being said, you might be fine just leaving out the water all together and only using 2 cups of flour, but I’ll give you the recipe as I made it since I’m sure it still comes out tasting fantastic. Put the flour, sugar, salt and lemon zest in your food processor and pulse until combined. The lemon zest will basically disappear. Add the Earth Balance into the bowl and pulse until it combined into a granulated mixture. Add water and lemon juice until a dough is formed. Separate the dough into 3 sections and shape into 1 – 2 inch rolls. Wrap in plastic and freeze for at least two hours. Preheat the oven to 300º and line two baking sheets with parchment paper. On another piece of parchment, sprinkle the remaining sugar and roll your logs to coat the outside. Slice into 1/4 inch rounds and lay about an inch apart on your baking sheets. Cook for 16 to 18 minutes, rotating the sheets half way through. Let cookies cool on a wire rack and enjoy.